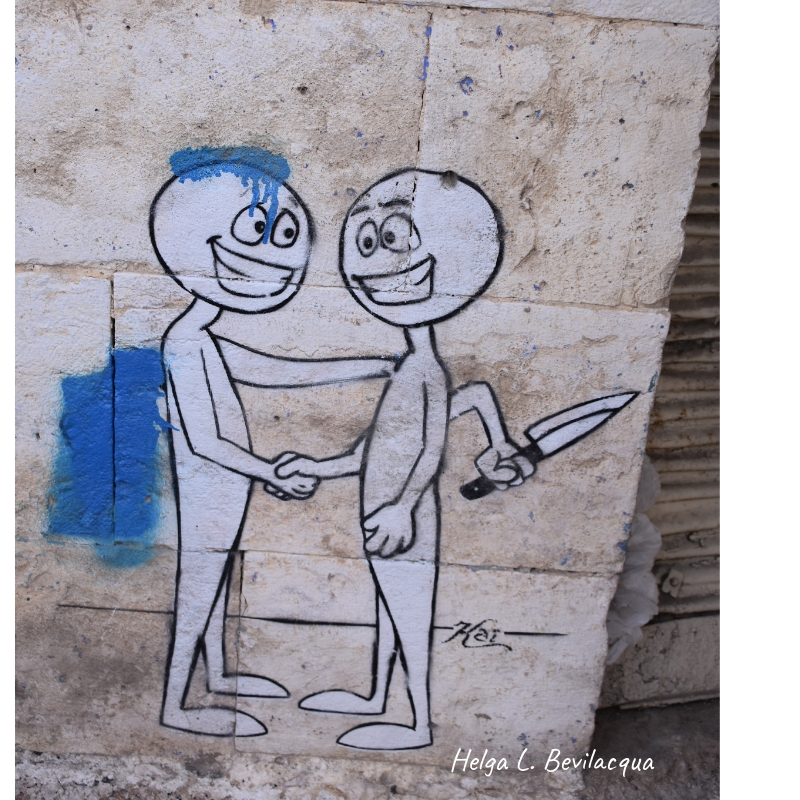 Palestine: could peace be a choice? Since I was a girl, I heard about Palestine on the news. For me, it was a war zone and a place that I never expected to visit. But I was in Jerusalem at a hostel and I saw a poster mentioning about some tour to the West Bank. I looked on the internet and I decided that I wanted to visit Palestine. The magic of traveling consists of seeing with your own eyes, right? So, I wanted to see, smell, feel and taste Palestine with my own eyes, and someway somehow, understand why, for so many years, the conflicts still remain on this part of the word. 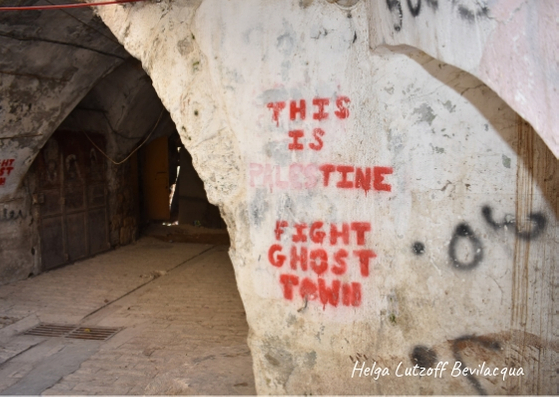 The tour started early and head us to Hebron, one of the most conflicted cities on the West Bank. 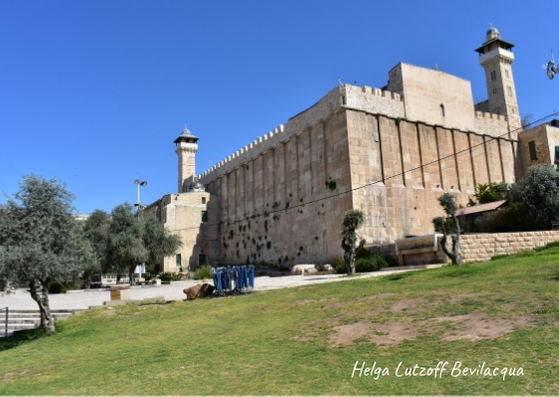 It’s also a sacred place for Jews, Muslins and Christians, because of the Cave of Patriarchs, where Abraham was buried. The guide picks up the group around 6h30 in the center of Jerusalem and from there we went to the bus station. Hebron is around 30 kilometers from Jerusalem, and we did all the travel on a regular bus, but with bulletproof windows. Gabriel was our first guide. He was born in Hebron, is Jew and carries a gun on his waist. He explained to the group that the gun was for self-defense purposes and would be used only in cases of extreme necessity. He explained some rules of security that were basically: (i) show your passport every time someone asks you; (ii) don’t carry any kind of object that can be considered as a gun, such as lighters, pocket knives or even toy guns, (iii) don’t take photos on the checkpoints, (iv) if someone asks for your religion tell that you’re Christian, (v) walk with the group. The tour would happen in two parts. First, we would visit the zone called H1, which is controlled by Palestinian authorities. Gabriel would bring the group to a checkpoint where another guide, who’s Palestinian should lead us. After we would meet Gabriel again to visit the zone called H2, which is controlled by the Israel authorities. Hebron is divided into these two zones since 1993 after the signature of Oslo Agreements. Israelis and Palestinians are not allowed to walk in the areas which are not controlled by the following authority. 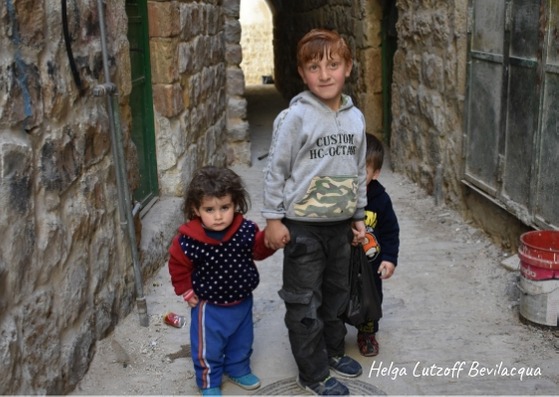 During the travel to Hebron, Gabriel tells us some episodes of his childhood, which includes the murdered of one friend and some people from his family. 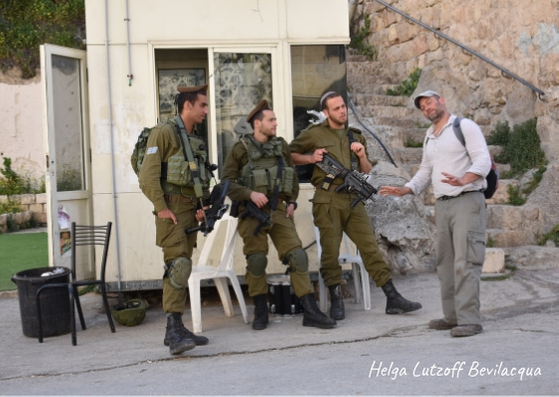 He doesn’t live in Hebron anymore but still works for some projects in the zone H2, including being a tour guide. When we arrive in Hebron, Gabriel leads us to a checkpoint, where we meet Mohamed, our Palestinian guide. Even with guns, checkpoints and a big tension in the air, at any moment when I was on the tour, I feel worried about my security. 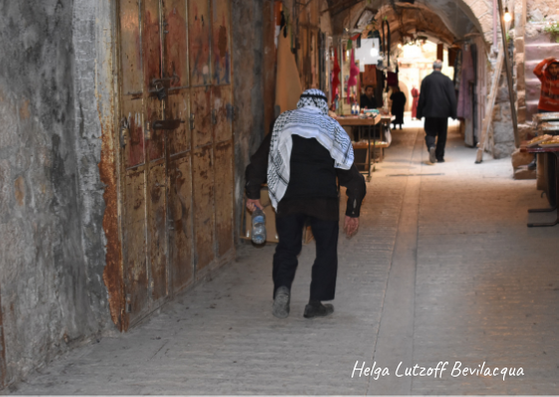 In a few steps, walking in Hebron, you understand that you’re not there as a tourist, but as a witness from both sides. And as a witness they want you to be safe, on both sides. 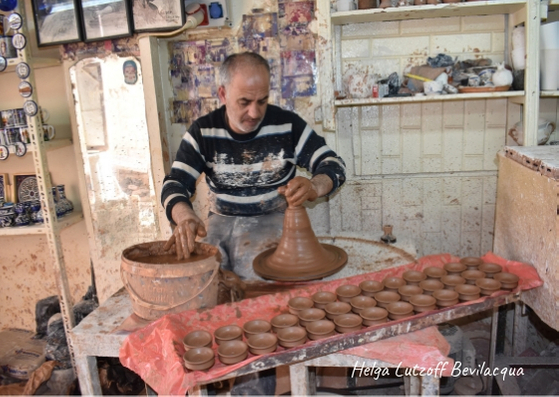 Until we were waiting for Mohamed, I entered on a pottery atelier, where some men were working. They are from the same family. Nobody smiles, but they let me take pictures of them. Work is what brings normality to the heavy air of Hebron. It’s also a way to escape from the painful stories that are told in every corner. I saw in those men some energy and some silence in order to keep things as normal as possible and somehow take the conflict away from their minds. As a western girl, I’ve been living the cliché of people who left a regular carrier to pursue your dreams. But looking into work inside Palestine make me think a bit how is to work in a place where dreams seem to be so far away. 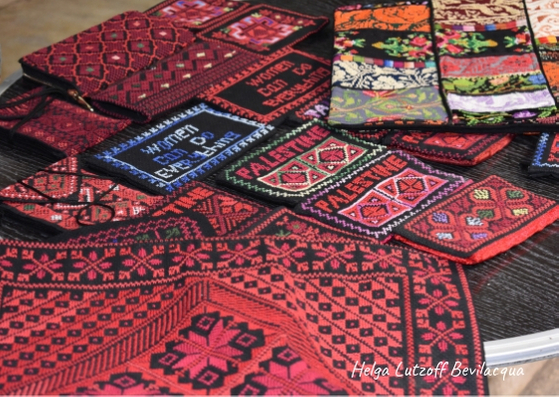 The first place we visited inside the Palestinian part of Hebron was the Central Market. It’s almost abandoned after years of conflict. The walls of the market are also a division for the Jewish part and the Palestinian part. For this reason, it’s covered by a wired net, where you can see stones, garbage, and stakes that are thrown by the neighbors. For Arabs, the market is a symbol of many things. So, to watch this huge market dying was very sad and painful too. The merchants beg tourists to buy stuff and explain the whole situation inside the old market. After this, Mohamed led us to his aunt’s home, where a lunch was served. We had some saffron rice, chicken and pita with hummus. I really like the food and especially the kids that were curious about my camera. 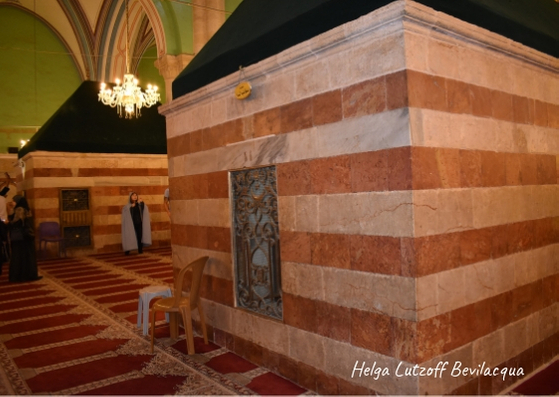 We also visit inside the Muslim part of the Tomb of Patriarchs, where Abraham was buried. In 1994, an Israeli soldier which always was Jew shot and killed 29 Palestinian Muslims inside the mosque. After this, the place was also divided, and the mosque and the synagogue are separated. Walking around the streets I hear many stories of people who were murdered, and nowadays you clearly see that poverty struggles the survivors. Friends, families, people of all ages. 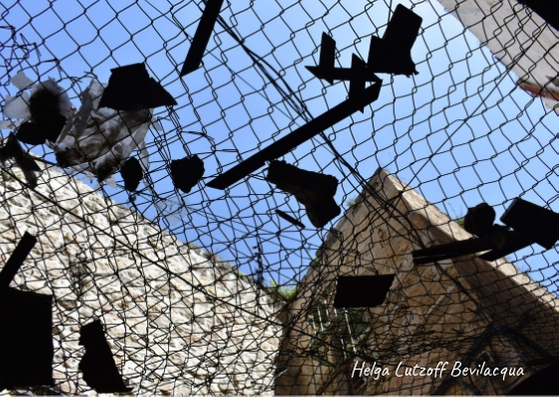 Shots, knives, and bombs leave deep scars in the street of Hebron. The dry blood becomes dust and hate, and it seems that time will never erase it. Mohamed leaves us in the same checkpoint we started the tour. Gabriel is on the other side waiting for the group. Both shake hands between the fence and in some steps, we are in the Jewish part of Hebron. The first stop now is the Abraham Avinu Synagogue which was destroyed in 1929 during the Hebron massacre. Inside you can find a 500 years Torah scroll which luckily survives the destruction. 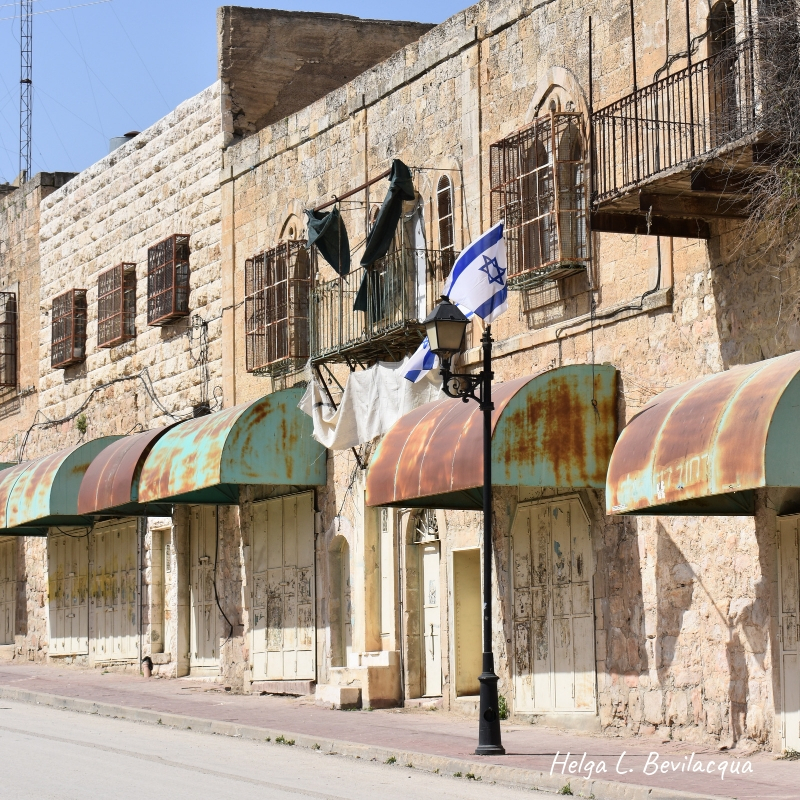 We also walk on King David Street, which is nowadays abandoned after countless attacks. From 1990 to 2000 many incidents involving bombing, shootings, acid attacks and harassment happened in this street. At the end of it, and old hospital was converted in a memorial for those who were murdered in Hebron. The lady that takes care of the place had his father murdered in 1980. I couldn’t hold my tears to listen to her. When we left, we had the opportunity to talk with a group of Israeli soldiers. They behave in a very different way considering the part where they are. In the Palestinian part, they are a bit rude and intimidating. In the Jewish part, they seem to be more friendly to tourist. The general of the group is 23 years old. He carries in his body grenades, bombs with moral effects and two rifles. He also carries the weight of many decisions and probably sad stories that he keeps with him. I asked what is his dream and he answers me that is traveling the world, after leaving the Israeli army. We had the same dreams. I leave Hebron with a lot of confusion on my mind and my heart heavy. Nobody that's seen a conflict as a witness can judge those people. Many of them lost fathers, mothers, sons, daughters, wives, husbands, and families. Many of them buried their beloved ones. Those people carry some painful scars, that probably will never disappear, and they are there, making the terror story of Hebron. In my opinion, the desperate truth of war is that nobody wins in the end. Hebron, for me, is a sad proof of this. I still keep the silence of those streets in my heart and those sad stories on my mind. I dream with the day that peace can be a choice. A day, where everyone can leave the hate, the sorrow, and the grief in order to forgive and give a chance to peace. Hebron showed many things, in a war, nobody wins. Choose peace. In small or big decisions, choose peace.